Is the world ready for a Jackson comeback? Former Billboard music critic: "He's a huge star there still"
(CNN) -- The world has certainly changed since Michael Jackson last staged a concert tour in 1997 to promote the "HIStory" album. 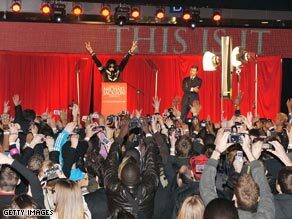 Fans clamor in London as Michael Jackson announces his return to performing. Since then, other performers have gained prominence -- some who have even been tagged as heir-apparents to Jackson, such as Usher and the currently legally troubled Chris Brown. Now the original is back. Jackson announced Thursday that he'll perform 10 concerts in London in July. Publicist and writer Howard Bragman said it's up to the public. "He's playing off the fact that people have the wonderful ability to have short memories," Bragman said. Bragman said Jackson, who is slated to play the 20,000-capacity O2 Arena, is better off playing smaller venues rather than booking huge stadiums that may not sell out, an embarrassment a returning veteran can't afford to risk. "It's sort of like the political thing, how you always want to get a small room and make it look full," Bragman said. "Have reasonably priced tickets and do some of your classics. I certainly think that at one point there were tens of millions of Michael Jackson fans worldwide and I think there have to be still some Michael Jackson fans." Culture critic, filmmaker and former Billboard music editor Nelson George said British fans are much more forgiving of Jackson's troubles than are Americans, who expect celebrities to be "saints and heroes," George said. "The love for Michael Jackson in the UK is undiluted by any of the stuff that's been talked about here in the states," said George, whose soon-to-be-released book "City Kid: A Writer's Memoir of Ghetto Life and Post-Soul Success" offers some insight into the era in which Jackson's popularity exploded. "He's a huge star there still and he will sell out all of those shows," George added. George recently returned from London, where he witnessed firsthand the adoration that European fans have for the singer. While there, he said he attended "Thriller," a sold-out tribute to Jackson in London's West End. George points out that Jackson is pursing a similar path to the one the musical artist Prince took in 2007 when he played 21 nights at the O2 Arena. Given its London location, George observed the venue has the potential to attract fans from across Europe. Moreover, George said, the British have long been admirers of black music and culture. "It's the perfect place for [Jackson] to play," George said. "There will be fans there from all over the world, including the United States."